PBX stands for Private Branch Exchange, and it refers to your business’ internal phone system. It allows for employees to call each other, and take and receive external calls through a certain number of external phone line connections as well. Rather than having individual lines for each phone in your office, a PBX offers a centralized hub unit through which each line can pass. Fewer lines mean fewer costs for your enterprise, as each PBX is operated by the individual business or service provider, rather than the telephone company. In our full PBX guide, below, we explain all you need to know about PBX systems and how to go about choosing one. PBX – Private Branch Exchange – is an internal phone system for a business. A standard PBX system provides many calling features, including call waiting, call forwarding, auto-attendants, hold music, voice mail and more. The PBX model of business phone system management came about as an automated version of the traditional telephone operator who used to run manual circuit boards via wires and connectors. The system is fully automated, fast, and equipped to handle a number of telecom demands. When it comes to choosing the PBX system that’s right for your company, you have two key choices, depending on whether the PBX has a physical presence on your business premises or is hosted in the cloud by your VoIP service provider. An IP-PBX operates in a similar way to a traditional analogue PBX, but it incorporates VoIP technology. VoIP (Voice Over Internet Protocol) allows users to make phone calls through the internet, relying on data rather than analog audio signals, and therefore avoiding certain phone company charges. With an IP-PBX, voice and data networks are intertwined. 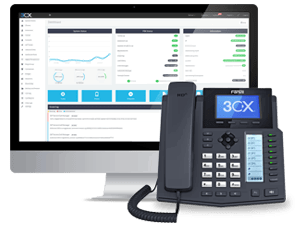 This holds an advantage over basic PBX services, as the converged networks make internet access and traditional telecom services possible within a single line for each user. It also consolidates your maintenance costs. For small and medium size businesses that need an enhanced telephone system but don’t necessarily have the resources to invest in the wiring infrastructure and hardware setup and maintenance costs of an on-premise PBX, a hosted VoIP service will be the better solution. With a hosted PBX service, the hardware phone data servers are maintained by the provider off-site, in the cloud. The system is typically more affordable in the long run than an on-premise PBX for businesses below a certain size, due to the smaller investment up front and the ongoing savings in operational and maintenance costs. In a nutshell, hosted PBX providers allow your company to make calls using the internet, while leaving the hosting and servicing of the system to the provider off-site. You don’t need to worry about maintenance, upgrades, or the demands of office space, as they’re all handled by the provider in a separate location. For small businesses that need enhanced phone features but don’t necessarily have the means to afford a big-business telephone system, a PBX can help reduce costs while meeting your telephone demands. In addition to filling the need for a receptionist, it replaces the need for physical office space. Virtual, automated systems mean you can run your business from any location. Meanwhile, some providers offer flexible plans, allowing you to pay as your business grows, rather than locking you into one set rate. As your business expands, you’ll want to streamline your telecom system. A PBX can link your on-site employees with your remote sales force within one system. The number of telephone lines you had as a small business with only a few employees might not have been a burden, but as you grow, a business PBX can reduce your number of lines while saving money. Most likely, your large business already has some kind of coordinated telephone system in place. While basic services can meet basic needs, enhanced PBX systems can provide a robust suite of features and benefits. With multiple departments, a large workforce and employees who work remotely, you need a phone system that can multi-task. Both IP-PBX and hosted services can accommodate a variety of demands while reducing your company’s overall phone bill. Mitel specializes in host-based phone solutions, though they do also offer on-site services as well. Using their proprietary technology, they offer feature-rich but simple phones, and promise one low, per-user monthly charge with no hidden fees. While the hardware is hosted off site, you can take advantage of their intuitive web-based administration of your system from your computer. 3CX offers a software-based solution for your IP PBX needs, and promises to reduce your telephone costs by up to 70%. Its software can be installed in and operated from Windows, eliminating the need for advanced telecom skills. Plus, it can be configured to work with popular IP phones and VoIP gateways, and easily integrated with your employees’ smart phones. Which PBX provider is right for your business? The answer is never one-size-fits-all. The most important thing is understand the costs for installing a PBX system for your business, not anyone else’s. That means comparing quotes for the scale of operation that you’re running, and the specific business phone setup that has the features you’ll actually use. We have a handy Business Phone Quotes Comparison Tool you can use – simple fill in a few key details and we can serve you with quotes from various providers. The trunk provides network access to many employees by sharing a certain number of lines, as opposed to providing them individually. It might help to think of it like a tree, which has one trunk and many branches. When it comes to a PBX, trunk lines refer to the lines coming into the system from the telephone provider. Read More: What is SIP Trunking? The technology used for PBX systems performs the duties of old-fashioned telephone operators. Essentially, it takes an incoming call and routes or switches it to the correct destination. The size and storage of the hardware varies depending on which type of PBX system you choose, and in many cases the software can integrate with or replace that of your old phone system. The network of lines refers to the number of lines in use for your enterprise. These can be phone lines for your office, VoIP lines for the internet, or even lines that connect incoming calls to your business with your mobile phone or off-site line.